Corzan® Industrial Systems' CPVC material inherently offers superior resistance to the corrosive chemicals, high temperatures and elevated pressures found in the harshest processing applications. 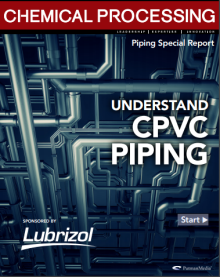 Backed by Lubrizol Corporation's nearly 60 years of experience with chlorinated polyvinyl chloride (CPVC), Corzan® Industrial Systems is trusted by the most demanding industries. Our material is inert to most acids, bases and salts, as well as aliphatic hydrocarbons. You can be confident you are getting a problem-free, long-lasting processing system that is easy to install, requires little-to-no maintenance, and offers optimum flow rates. All this translates to lower life-cycle costs, less downtime and greater value. Reliably transport aggressive chemicals at high temperatures, under pressure, without corrosion concerns. Stand up long-term to the high pressures and corrosive chemicals commonly used by power plants. Transport chemicals through some of the most corrosive environments imaginable without corrosion concerns. Withstand the demands of precious and raw material processing operations. Meet the high purity standards for cleanrooms and eliminate corrosion concerns caused by aggressive chemicals. Put an end to corrosion, even when transporting the most aggressive disinfection chemicals. The highest quality pipe, fittings and valves resistant to high temperatures and pressures. A variety of components are also available to create a complete processing system. Find the round and square ducts, fabricated fittings, industrial sheet, and welding rods needed to design and fabricate an entire fume handling systems. Bend, shape and weld Corzan CPVC into tanks, scrubbers and ventilation systems. Extrude the material into 48-in. x 96-in. sheets 1/8-in. to 3-in. thick. Over the course of nearly 60 years, Corzan® Industrial Systems has established a reputation of delivering reliability to a variety of industries and applications. Below are just a few stories highlighting our customers’ positive experiences using Corzan material. Engineers needed a piping material that could satisfy a variety of demanding conditions. Thorpe turned to Corzan material to transport and store hydrochloric acid at a chlor alkali plant. This chlorine plant converted its FRP piping to FRP/CPVC dual laminate piping. Does Metal or CPVC Perform Better In Industrial Applications? Our expert, timely support is a value-add offered to all prospects and customers who need help buying, specifying or installing Corzan CPVC.